Miss your pocket diary's year-to-view? Does this bring a sense of paper nostalgia? Zicron Software's Years is a sweet take on a calendar, with a 'less is more' slant. As fully–paid-up geeks and, perhaps more pertinently, as literally fully-paid-up MobileMe members, we're not likely to abandon the built-in Calendar with its reams of scheduling and multi-calendar support. 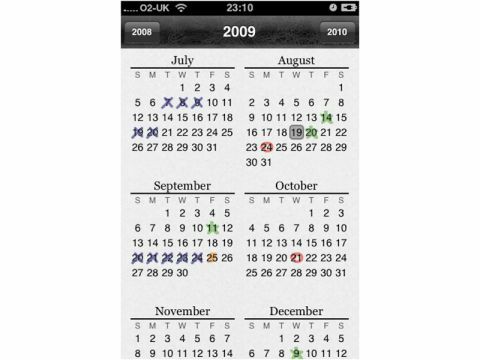 But if you yearn for the days when you marked birthdays, work shifts, holidays and more by breaking out your highlighters and attaching a year-to-view calendar in your little black book, then Years is one little iPhone app that will bring back those functions. Flip back and forth to show an entire year's worth of dates on a mini calendar, then tap on a month to add highlights. You can choose from four different highlights, and once you've picked one, just tap on dates to mark them. That's it! And costing just over a quid, it can't be knocked.